A great fictional character was once quoted as saying “if you can’t do something smart, do something right.” These words have stuck with me for most of my life, and have helped fuel many choices that I made. And as Tony Luciano, having just brutally murdered around a hundred armed guards, cautiously opening a door to find a stripper dancing on a pole, the phrase popped back into my head. “We motion captured the dancer,” our guide through the game told us, “that’s a real performance that we put into the game.” Yep, Blue Estate may not be smart, but it’s doing it right. Presented as a prologue to the rather good comic book, Blue Estate gives you control over Tony Luciano, an idiot criminal and son of the Don of the Luciano crime family, who is on a quest to save the aforementioned stripper Cherry Popz from the Sik Brothers gang. It’s a fairly standard crime-thriller story, but it’s pitched as a Tarantino-esque experience, so naturally its filled with blood, guns and some witty dialogue. 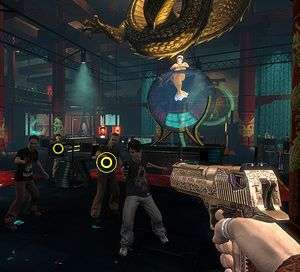 Gameplay takes the form of an on-rails gallery shooter, with your view moving from one screen to another as you take out hundreds of enemies that get in your way. 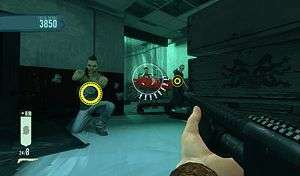 Enemies appear with circles around them that gradually get smaller and change from green to red, indicating when they’re about to shoot you, meaning you have to assess which is the most imminent threat and take them out first. 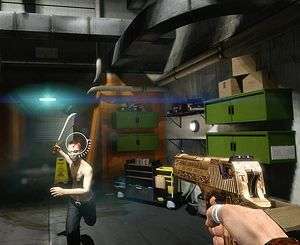 The difficulty looked pretty harsh, with our guide dying numerous times, but there’s health pick-ups to grab throughout each level, and from time to time you can take cover to avoid getting hit by incoming bullets. You’re not restricted to just a pistol either; our demo saw Tony grabbing a shotgun that blew several enemies away at a time with a satisfying explosion of gunpowder and blood. It’s simple pick-up-and-play stuff, but it looks like a whole lot of fun. The key area of interest comes in the form of the LeapMotion controller, a new piece of kit that allows you to turn your hand into a mouse on any computer without the need for calibration. It can be used for a variety of things; there’s already a dedicated app store online where you can purchase plenty of utilities to try out. But for this game, your hand becomes the gun. You simply point at an enemy and the game fires for you, unleashing the clip into any part of the body you’re aiming at until the enemy dies. There’s a couple of gestures to remember as well; reloading is as easy as pointing your finger off screen, you can take cover by pointing your finger down, and you can change weapon by simply opening and closing your hand. What appears at first to be a simple gallery shooter quickly becomes far more interesting, and the gestures are simple enough that the game remains pacy and exciting. New tech aside, Blue Estate is also a faithful adaptation of the comic, and brings across a gorgeous cel-shaded art style along with the series’ signature dark humour. The level we saw was a Chinese bar/restaurant, which was decked out in more Asian memorabilia than you could shake a lucky cat at and, even in the early state that we saw it in, the game looks gorgeous. Destructible environments are thrown into the mix too, so even the rare pieces of cover you do find won’t last very long as you come under attack from enemies, but the flipside to this is that you can take out their cover as well, leaving them well open to attack. The best part of the game, however, is the writing. A narrator helps fill in the gaps of the story during the quiet moments, but is often berated by a text panel that freezes the game and completely negates anything said. “My highly valuable sources,” starts the narrator, only to be cut off by a panel saying “…Wikipedia.” Tony himself is capable of throwing out some choice lines, frequently admonishing the bad guys for ruining his new jacket with their bullets and making fun of them as he shoots up their establishment. I’m not ashamed to admit that I was nearly crying with laughter as he took out waves of Chinese men, only to cry “I’m just doing my bit for overpopulation!” It’s dark, offensive humour that certainly isn’t going to appeal to everyone, but the line was so well delivered and completely out of left-field that it nearly knocked me to the floor. Having suitably embarrassed myself in front of several professional journalists by doubling over with laughter at the crass humour throughout, I left the presentation of Blue Estate suitably impressed and eager to get my own grubby mitts on it. It looks to be a very fun game mixed with a lovely art style and the subtlety of a brick, which is something I am always a fan of. While being pitched as a killer app for the LeapMotion, Blue Estate should also be finding its way to home consoles at some point in the future.